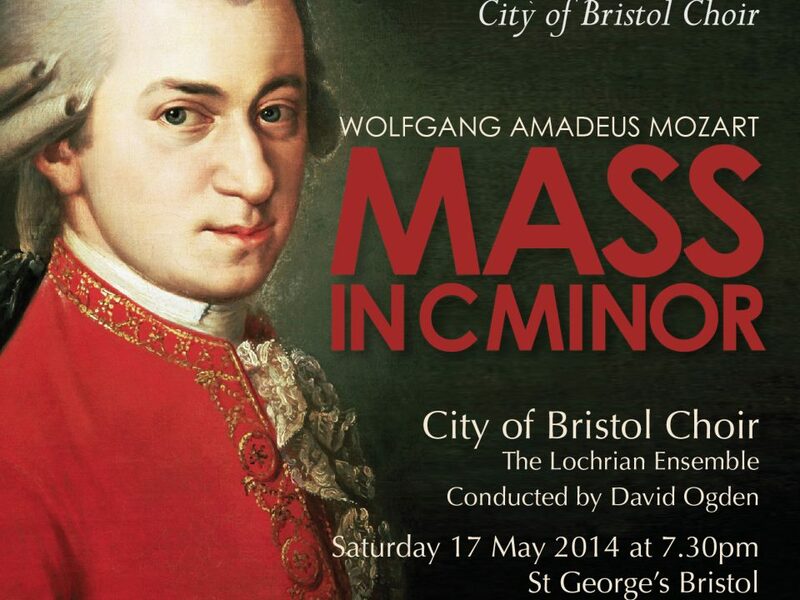 City of Bristol Choir presents two virtuoso choral works with professional orchestra, the Lochrian Ensemble. Mozart’s stirring ‘Great’ Mass in C Minor combines beautiful and virtuosic soprano duets, rousing and dramatic choruses, and orchestral fireworks. The line-up of soloists includes rising stars of the opera world. Portuguese soprano Susana Gaspar represented her country at Cardiff Singer of the World in 2013 and is a frequent soloist at the Royal Opera House. Scottish soprano Eleanor Dennis regularly appears with Scottish Opera and was recently described by Fiona Maddocks in The Observer, as a “singer with amarvellous future. I’m not sure I can ever remember a soloist who so obviously deserves to be a star”. As well as his many opera roles, the “exciting” tenor Ed Lyon has appeared as a soloist at the BBC Proms, and was described by The Guardian as “one of Britain’s top baroque tenors”. City of Bristol Choir has built a reputation for stylish, committed singing full of energy and vitality. The superb acoustic of St George’s Bristol is the perfect venue to experience the inspirational power of hearing this glorious music live. • Or purchase from St George’s box office in person. The box office is open for personal callers on Monday, Tuesday, Thursday and Friday from 12 noon to 6pm.